Cro-Mag already knew how to help its clients, empowering men to take control of their personal goals for a better lifestyle. However, while Cro-Mag knew how to help clients, the company struggled to find those clients. This is where the team at Ad Army Group Marketing Services came in. Cro-Mag wanted to improve its current brand and marketing platforms to better reach high performing, professional men. Ad Army Group knew just where to start. Cro-Mag was proficient at helping men improve their physical, mental and emotional well being, but the Ad Army Group could handle the marketing consulting and corporate identity development needed to grow. We used our knowledge and skill to help Cro-Mag define itself in a competitive online market and expand its client base with well developed brand identity techniques. We started by updating their brand and reinventing their web design. With the Ad Army Group, the website is now perfectly geared for maximum SEO impact and incorporates high quality photography, video production and a new logo design. The entire website was created to be interactive, heightening the experience for new and returning clients. This work gave Cro-Mag an improved corporate identity to expand its future work with clients. Ad Army Group recently accepted the challenge to create a strong online presence of Cro-Mag Lifestyle Coaching for Men. The Cro-Mag program is designed for men over 50 years of age who struggle against a sedentary lifestyle and carry excess body weight. The five decision areas encompassed in the program include nutrition, exercise, recovery, sleep and stress management. The message was encompassed in the webpages that have been captured in the left column of this page. Visual images on the Cro-Mag website allow the reader to grasp more information from the first glance. To visit the CRO-MAG website click the "LINK TO WEBSITE" button at the left. A specialized training program for men can be lost in the crowd without proper marketing. This fitness program has many unique attributes that had to be showcased on the website landing page. Powerful graphics allow the visitor to see that this is no ordinary diet fad or fast track program. Innovative designs reflect the uniqueness of the Cro-Mag approach to health and wellness, which is designed to improve the quality of life for a large segment of the population. Health problems will be addressed without medication or traditional treatments. The website includes a list of ailments that have been avoided by the participants of the program. On the website landing page, the visitor notices a large man with a microphone in his hand. Identifying with this person, more information is sought in the subsequent pages. Middle-aged men identify with this man personally or know that current lifestyle habits will lead to obesity, and the related health problems. Well-planned webpage progression will hold the interest of anyone who comes to the website. Detailed answers to many common questions about the program are offered to prevent the reader from feeling a sense of ³being sold.² Smooth transitions between the pages allow the reader to revisit each page quickly and learn more about the entire program. With closer inspection, the visitor will notice the logo in the upper left corner of each page. Men who are seeking to embrace a more active lifestyle identify with the masculine silhouette that exudes physical fitness and strength. Without reading the text in the logo, the visitor senses something different about this fitness program. Interest grows as each page is reviewed for more details. Photos on each webpage demonstrate the remarkable results achieved when an overweight, middle-aged man embraces the Cro-Mag 60-day Program to Become Homo Sapiens. Any amount of text would omit the visual changes that happen to the human body when proper nutrition and exercise are included in the daily routine. Once the participant realizes measurable results, the motivation to stay in the program remains in the heart and mind. Physical trainers know that physical appearance is important to most people. The use of pictures on the Cro-Mag website grabs the attention of the individual who visits the home page. Curiosity draws the visitor into the other pages to learn more about the program. The various attributes of the program are not withheld until some future point in time. At the top of each webpage, the visitor has the option to click on the image that says ³Get a FREE EVALUATION.² A webform is displayed for the potential program participant to provide basic contact information. An expert on the Cro-Mag team will respond to the inquiry over the phone or through email. A marketing expert, like Paul Cookson, realizes that the right information is essential for the person who wants to make a lifestyle choice. Each page of the Cro-Mag website reveals important facets of the program in a clearly understood format, which is written in simple terms. As the visitor scrolls down the page, each section on the ³Program² page provides more information. Images on the webpages are appealing and helpful, and the text offers important insight into the program details. People, like Liam Robertson, who have a desire to help other people design fitness programs that highlight important daily decisions that will improve an individual¹s health and well-being. His story is shared on the ³Our Team² page of the Cro-Mag website. His extensive exposure to the health challenges facing middle-aged men made him realize how important lifestyle changes become as age and a sedentary lifestyle progress. On this page of the website, pictures of the other people on the team accompany each person¹s story. Interested people who have a need to embrace better nutrition and exercise routines will find testimonials on the website from others who have found success. Actual stories reveal the health problems that were avoided because of the eating and exercise changes that each person embraced. Health diagnoses from a physician can be reversed with assistance from the people at Cro-Mag. Instead of living with significant health challenges, the participants in the program learn how to eat right, exercise and get enough sleep in the quest to address health problems. The testimonial page encourages website visitors find out more about the program. Video production is an important tool used to address common concerns that have been raised as others have encountered personal challenges. Videos on the website provide understandable explanations for each of the program¹s phases. A videotaped conversation for each critical lifestyle decision area is held between Paul Cookson, expert marketer, and Liam Robertson, CEO of Cro-Mag, and reveals the important facets of the program. The website visitor realizes that the suggestions in each phase can be included in daily life without difficulty. Busy people do not have time for massive lifestyle overhauls that require major adjustments. The Cro-Mag program allows participants to make helpful changes that work. 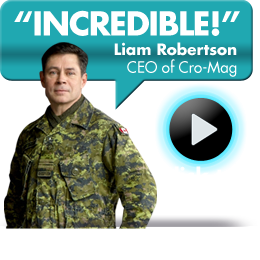 Written words on a webpage are not as engaging as the video production that accompanies the Cro-Mag web design Toronto. As a marketing expert, Paul Cookson evaluates the various media available prior to constructing the website. Careful choices will ensure that the client¹s website retains the attention of each visitor long enough to make a decision to proceed. The immediate decisions that happen in the human mind can be guided to the right choice with proper use of every marketing tool. Paul Cookson asks questions of Liam Robertson to create a forum that the viewer would appreciate. The answers are direct and include the reasons behind each facet of the program. Conversations in these videos are not lengthy because the interested website visitors will not have time to watch extensive videos. Basic information in a video leads the potential program participant to peruse the other webpages in pursuit of additional details. Monthly blog entries chronicle the team¹s ventures with program participants. Readers will be encouraged to embrace each step of the program to be able to participate in future ventures. Blog entries are written to provide helpful information including reviews of food categories, medical explanations, health tips and motivational suggestions. Every website will include a blog that draws participants back to the website on a regular basis. This consistent communication encourages each person to continue on the quest toward improved health and a more active lifestyle. The sidebar on the blog allows the website visitor to access older blog entries. Categories exist to group the blog entries that are meaningful to the reader. Fast access to similar blog posts will retain the reader¹s interest and provide additional information that can enhance personal motivation to continue on the program. Ad Army Group embraces a core philosophy of great web design and effective marketing plans, which are linked together. The client¹s website offers a comprehensive picture of the business, program or person represented on the site. Biographies, videos and meaningful examples about products, services and industry offerings will work together to enhance the perception of the Cro-Mag lifestyle program. Each website is designed to communicate a cohesive message to every visitor. Search engine results will place the Cro-Mag website on the first results page as time passes and consistent updates along with fresh content are added. Websites designed by the Ad Army Group team will reflect the characteristics of each client¹s venture. Visitors will notice that the camouflage clothing worn in the pictures on the Cro-Mag website cause the visitor to think about the physical stamina of healthy, strong men. Images on every client¹s website will be interesting and helpful in the quest to hold the interest of each person who visits the site. Written text on the website is concise and answers the most common questions asked when potential participants make contact with the client. CALL TODAY ­ AND GET STARTED! Each client website example on this site reveals the variety of work performed by the Ad Army Group, which is led by Marketing Expert, Paul Cookson. HIRE AN ACE to present your marketing messages to the right people. Call 416-286-2860 ­ TODAY! Just one phone call could be the answer for your company. A dramatic marketing redesign featuring photography, logo design, video production and complete web development.